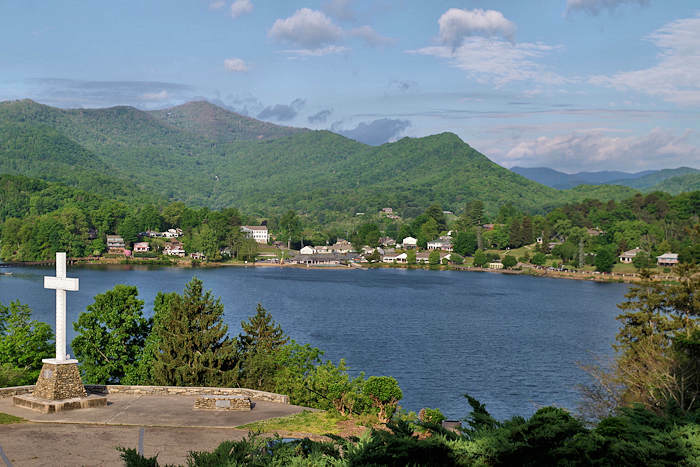 Gorgeous Lake Junaluska has been a mountain retreat for the Methodist church since the early 1900s. Many do not realize that this lake "resort" town is open for all to enjoy with plenty of things to do and places to stay. 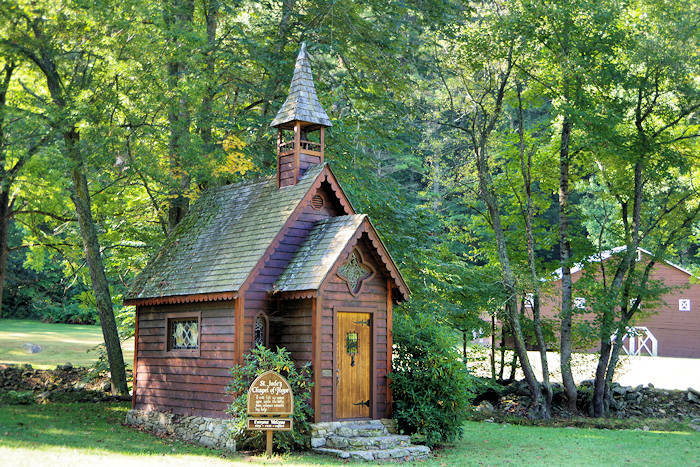 It's at the foot of the Great Smoky Mountains near Waynesville and Maggie Valley, about 30 minutes west of Asheville. Since the retreat's mission is to "renew the soul, mind and body," it's a perfect place to get away from the hustle and bustle of life in a very scenic setting. The town surrounds a 200-acre lake. Spend the night lakeside, explore 16 gardens, walk around the lake, play golf or take a boat tour (to name a few!). 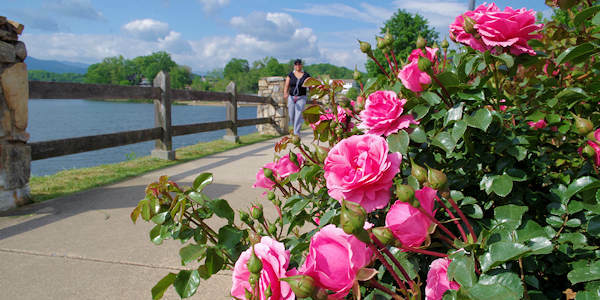 Lake Walking Trail and Rose Walk: A scenic 3.8-mile paved path winds around the lake with resting points to relax and soak in the views. Cross the lake on the Turbeville Footbridge for a shorter 2.3-mile loop. It's wheelchair and scooter friendly, and most sections are flat. Find plenty of parking at many locations adjacent to the trail, and take a break at Junaluska Gifts & Grounds coffee shop along the way. Read more about the Walking Trail. Kayak, Canoe & Paddleboard: Have fun on the lake from Memorial Day through Labor Day with rentals available every day. Boat Tour: Take an excursion on Cherokee IV at 8 PM every day during the summer. Cost is just $5 per person! Tickets are available at Junaluska Gift & Grounds in the Harrell Center. Bird Watching: A favorite location for birding, with top spots along the lake near the pool, the parking lot near Memorial Chapel, the cross at Inspiration Point, across the dam on Lakeshore Drive and the boat ramp. Pick up a checklist at the Welcome Center. Corneille Bryan Native Garden: Features 500+ species of native plants and a haven for birdlife. Fish: The lake is stocked with bass, catfish, crappie and others. You'll just need to have a valid North Carolina fishing license. No motor boats on the lake. Golf: The 18-hole course offers affordable rates, spectacular views of the mountains and the lake, a layout designed for all levels, advanced tee times and PGA instruction. Mini Golf, Tennis and Shuffleboard: Play for free with your equipment or rent some at the Soda Shop. Labyrinth: Enter and walk this sacred path at your leisure, alone or with others. 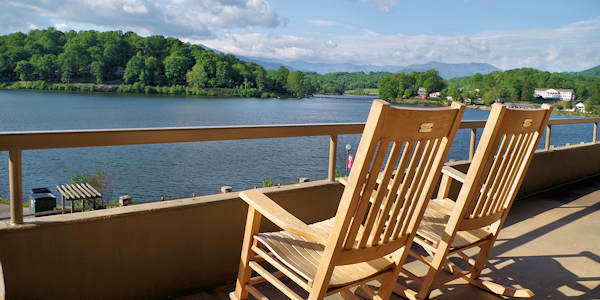 Lodging: Lake Junaluska has a wide array of places to stay, including The Terrace lakeside hotel with scenic views and rocking chairs. Go to their Web site for more. Charming and historic, Lambuth Inn sits on a hill overlooking Lake Junaluska with panoramic views of the mountains and lake. The recent renovation recaptured the original elegance of this stately inn, which was built in 1921 and is listed on the National Register of Historic Places. Rates are $95-$200/night. Go to their Web site for more. Also find vacation rentals and economy rooms. Lodging is open to the public all year. Restaurants: Dining options include buffet-style dining year-round at The Terrace and Lambuth Inn hotels. Junaluska Gifts & Grounds, located in the Harrell Center, offers specialty coffee, hand-dipped ice cream, smoothies and snacks. During the summer, cool down at the Lake Junaluska Soda Shop near the pool for snacks and drinks. Camping: Find RV and tent sites, apartments and a meeting lodge with full hookups, pet-friendly campsites, picnic tables and fire rings. Open April-October. 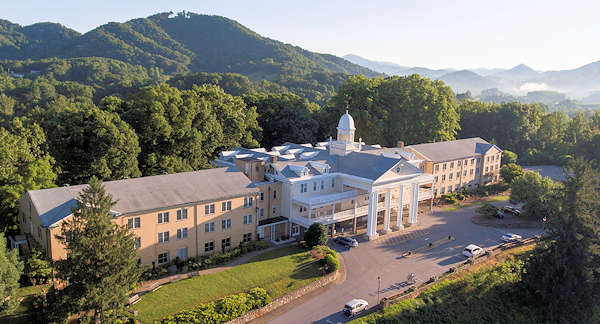 Weddings & Reunions: The Lake Junaluska Conference and Retreat Center is the perfect location for weddings of all sizes, family reunions and friends' gatherings. Their lakeside conference facilities include a nice variety of venues for all size of events. And with plenty of dining and lodging options, your entire group can stay and play together without driving to multiple locations. 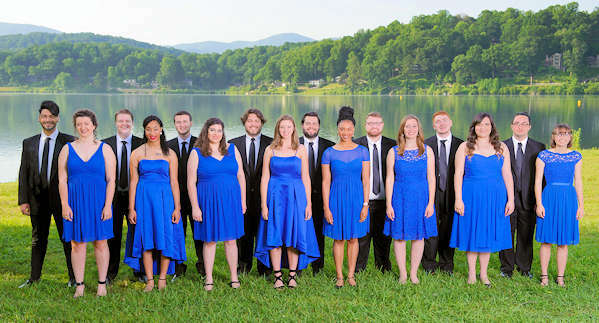 Lake Junaluska Singers: This 16-voice professional ensemble has performed nationally and internationally for conferences, dignitaries and major events. Their music ranges from classical choral and contemporary works to gospel, folk and musical theatre styles. Plan a visit during one of their concerts. Take part in Easter egg hunts, a 5K and fun run, an outdoor sunrise service, and delicious breakfast and lunch buffets. 2-night packages are available. Go to their website for details. Celebrate with concerts, special meals, fireworks and more. Highlights on the 4th include the parade at 11 AM, picnic 12-2 PM and fireworks at 9:30 PM. 4 night overnight packages include lodging, special meals, concerts, and fireworks special seating. Go to their website for details. Hear traditional music and dance of the Southern Appalachian Region with fiddlers, banjo players, string bands, ballad singers, buck dancer and square dance teams. 2-night packages include lodging, continental breakfasts and access to all concerts. Go to their website for details. Go to their website for details. Enjoy an exquisite Thanksgiving feast in the mountains. Choose and cut your own Christmas tree at a nearby farm to take home with you. Ticket to Biltmore Estate may be purchased with packages. Go to their website for details. Purchase a 2- or 3-night package to enjoy this winter festival held at Lake Junaluska that features some of the top bluegrass and acoustic musicians in the nation. Come for music, workshops and jam sessions. Go to their website for details. Special weekend with festive live music, hearty meals and local artistry. Events include Handel’s “Messiah,” the Appalachian Christmas Craft Show and a concert. 2-night package includes breakfast and dinner. Go to their website for details. 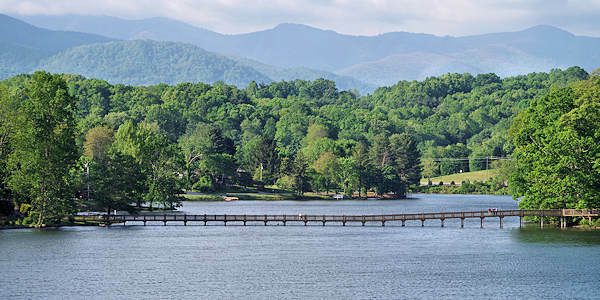 History: Lake Junaluska was founded in 1913 to provide space for fellowship, worship and recreation along the shores of a tranquil mountain lake. The name comes from Junaluska Mountain, which was named after a Cherokee Indian Chief who saved Andrew Jackson’s life during a battle. The World Methodist Museum on the lake houses the largest collection of Methodist history, artifacts and memorabilia in the world. From I-40 West, take exit 27 onto US 19-23. Drive 3 miles and take exit 103. Drive about 1 mile until you see Lake Junaluska gates on the right. Bear right and follow the main road to the Bethea Welcome Center. Stop there to get a map and best places to visit on that day. 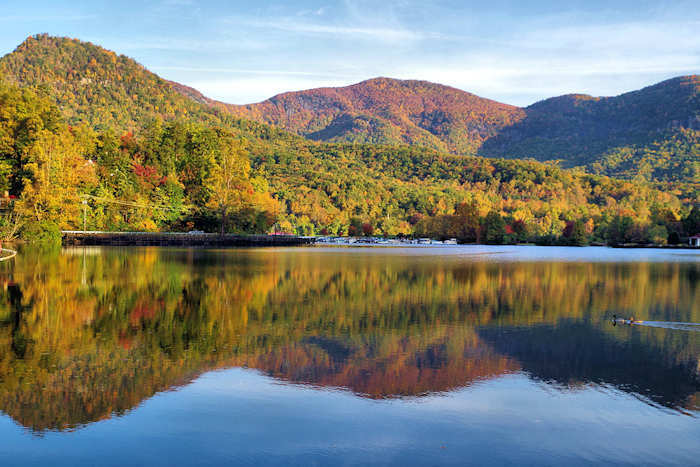 Scenic Drive: The Appalachian Medley Scenic Byway begins near Lake Junaluska. Read more! 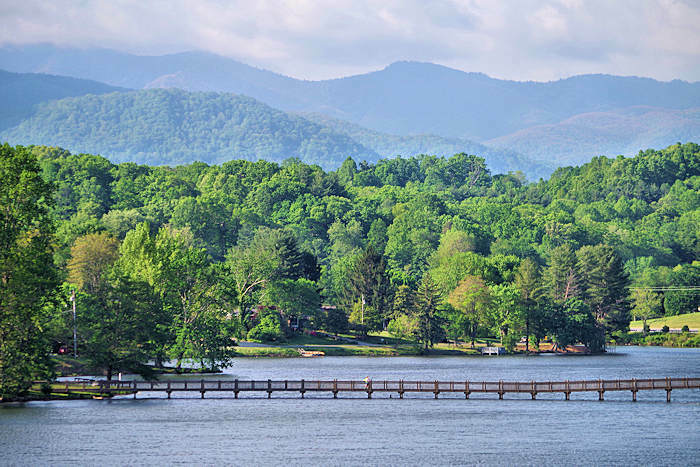 Play by a beautiful lake in the shadows of the Great Smoky Mountains. The 18-hole course is 5,034 yards and par 68. Green fees start at only $15. Stay a few days with a variety of lodging options, from hotels to cabins. Located near Waynesville and Maggie Valley, a 30-minute drive west of Asheville.